Wall switch ZTCi with built-in transformer allows it to control directly a ZC24 electrical motor and control electric accessories from Fakro: ( external blinds ARZ-E, ARK-E, blackout blind ARF or Venetian blind AJP-E). ZTCi is equipped with an infra-red receiver which allows it to control accessories with ZRC remote control. Suitable for remote operation of electric accessories connected to ZTC3iw control unit or ZTCi switch. 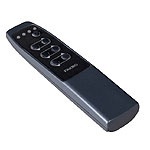 Remote control can operate maximum four 3-channel control units ZTC3iw. This option makes it possible to operate maximum 12 receivers with the use of remote control. A single top button operates control unit. Other buttons operate three channels of the chosen control unit.